If your family loves burritos, you need to try this recipe. It’s one of my husband’s favorite grab-and-go foods! We’ve made it time and again since I first discovered it on Amy’s blog. What I like best about this recipe is that, not only is it filling, but it’s also fast. 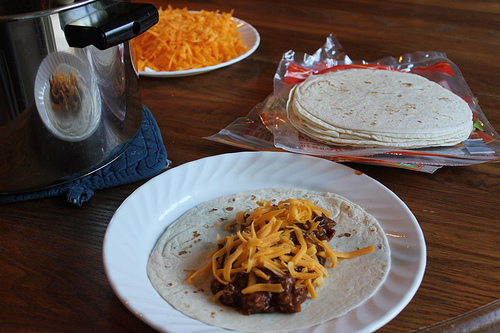 You can have a piping hot burrito in less than two minutes — straight from the freezer. It’s perfect for those times when my husband wants a late-night snack or some hot for lunch on the weekends. These are little too much on the spicy side for my liking (keep in mind that I’m also the girl who likes extra mild salsa! ), but my husband loves these. In fact, he was so excited I was making them again this week. Brown ground beef with onions. Drain and add all remaining ingredients except tortillas (and cheese, if you want to sprinkle the cheese on instead). Bring mixture to a boil. Reduce heat, cover, and simmer for 20-30 minutes. Spoon 1/4-cup of the meat mixture onto a tortilla, sprinkle with cheese (if you didn’t melt cheese into the mixture when you simmered it). Fold sides in and roll up tightly. 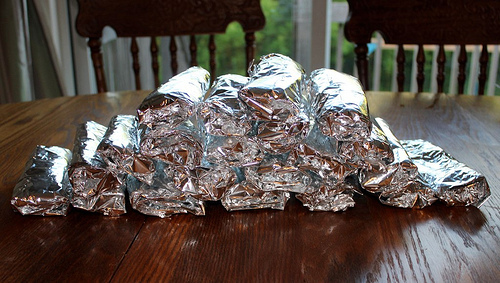 To freeze: Wrap each burrito in a paper towel and then in a foil square. (I skip the paper towel part since we don’t buy paper towels.) Put burritos in two airtight ziptop freezer bags and store in the freezer for 2-3 months. To serve: Pull out desired number of burritos. Remove foil (you can save the foil and reuse it the next time you make brown bag burritos!) and heat a single burrito in the microwave for about a minute or leave the foil on and heat one or more burritos in a preheated 350-degree oven for 30 minutes or until heated through. These can be eaten plain or served with lettuce, cheese, salsa, and/or sour cream. Recipe adapted from Amy’s Finer Things. Posted with permission. I made my batch after I went grocery shopping. I got more than 20, more like 26. My burritos are not as “pretty” as yours. The bean mix was really good but next time I will not put so much salt or chili in. We like mild tasting burritos here too. I put my chicken on to cook to make other freezer items in the week. Tomorrow we will have burritos :). My husband and I LOVE these burritos!!! Do you really boil the cheese with everything for 20-30 minutes? That’s how the directions read. Just checking? The original recipe calls for boiling the cheese in. This time around, I left out the cheese when I boiled it and I sprinkled it on the individual burritos as I made them. I forgot to note that in the recipe. Thanks for reminding me to fix that! Just make sure you heat them over the stove burner after you defrost them. Ladies and gentlemen, this goes for corn and flour torts. Please heat them on an open flame or on an electric burner. They fold and taste so much better. I’m Mexican-American and just hate eating raw tortillas! I have done that before with tortillas without a problem 🙂 I thawed a package of tortillas, filled them, froze them and oven heated and they tasted and looked the same. I have frozen my tortillas and then thawed the tortillas filled them and froze them again. I have never had a problem with the tortillas doing them this way. Sometimes the tortillas will fall apart more easily though. So we usually cook them from the frozen state by microwaving them without thawing them. this is great! my hudband has been loving the breakfast burritos and this is a great thing for him to take in to work for lunch. Does anyone have a tried and true recipe for enchilada sauce? I’d rather make my own than purchase it in a can. Crystal, Do you ever make your own refried beans? So quick, easy and cheap to make your own. Tammyz recipes has one. Its really yummy and makes a lot!! Sorry I cant link from my kindle so you can see it! I just added recipe links for the refried beans, enchilada sauce, and tortillas, for those who like to make everything from scratch. We tried homemade refried beans and I felt like it was a lot of work and wasn’t thrilled with the end product. Maybe they get easier to make the more you practice?? I’ve made these “refried” beans, and they were super easy and good – and I don’t usually like refried beans! Simple steps, and probably healthier since there’s no frying involved – but they’re still very flavorful. I’m actually planning to make more here pretty soon. I’m def. gonna try these! However I’m wondering if there is anything I could sub in for all the beans. Beans do NOT agree with my husband! Maybe I’ll just use half what it calls for? Could you add rice to these and still freeze them or would that not work out very well? You could probably half the beans and add more ground beef instead. Rice freezes in things like this fairly well, too. We put asafoetida in any food, especially beans, that upsets our stomachs or makes us gassy. It’s a middle eastern spice and you don’t need a lot. It can change the flavor of things so make sure to put it in before you add salt. I love burrito’s. I prefer mine without meat and just refried beans. Well, I don’t blog but I do try to save money. Freezer cooking…..Something I do with a group of girlfriends (there are 5 of us) is get together each month for a girls night. Each of us brings enough of a main dish in reusable freezer containers to feed each of the 4 other families (one dish per family) and enough of a desert or snack for each of the 4 other families. It could be a casserole and some cookie dough, a meatloaf and an apple pie, whatever you want to bring. BUT, it MUST be freezer ready!! The hostess serves the dish she prepared for the group to take home to her family. So, when everyone goes home, they leave with 4 entrees and 4 deserts/snacks that she didn’t have to prepare and that she can have ready to pop into the oven whenever she wants!! It really is fun!! Crystal posted a recipe awhile back for crispy chicken burritos (southwest?) that were freezer friendly. I made and loved those! I need to find that recipe again! I think you’re referring to the Southwest Roll-ups? I’m making/posting about those this coming Monday as part of the freezer cooking series. We love those at our house! You’re on a roll! Way to go!!! I had a GREAT time making wraps. I now want to make YOUR burritos. I made them several years ago. I am not a meat fan so I like to make them with ALL beans. YUM YUM. Thanks for sharing Crystal. I make breakfast burritos all the time, and I use these things called wrappers and I get them at the DOLLAR STORE. BONUS! I tried to make freezer food! I made a double batch of baked chicken chimichangas, but my teenaged sons thought they were pretty good, and they were all gone the first night! this happens at my house too! Oh I thought “name” meant my name in the entry box. Oops. The Link Party I use every week does it differently and I always forget. I continue to add to my collection. Faye: I love baked chimichangas too! Could you make a tutorial of how to fold and roll the burrito? When i try to fold and roll any kind of wrap it never looks right and it’s a mess. Tips or suggestions of how to do it well? Thanks. I have trouble with that also! What size are these tortillas? 10-inch? Marcin, I tried to reply just to you but it didn’t work the first time. See this post http://lifeasmom.com/2010/07/freezer-cooking-lunches-and-frozen-burritos.html and scroll to the bottom for a video demonstration of folding freezer burritos. Thank you! 🙂 Woot woot! I shop our local discount bread store on the days their trucks being back the items that are about to expire. It’s Tuesday and Friday here, but ask the clerk at your place. Anyway, they often have tortillias of all types and sizes for 50 cents a bag. I buy enough to supply my family of 7 for several weeks and keep the spares in the freezer. I’ll have to make these burritos. Our current favorite use is to give a tortillia a thin smear of peanut butter, then roll up a banana inside. It’s a quick and easy breakfast that can be eaten while waiting for the school bus. Does anybody know what purpose the paper towel serves? Since Crystal skipped that part of the recipe, I’m thinking it’s not crucial… but I’d like to try making these and if it helps the burritos reheat better in the microwave, I’ll do the paper towel step. If it makes no difference, I’ll skip it too! I use a damp paper towel to reheat. Not sure if that’s what this particular recipe used it for, but I find the dampness helps keep bread, tortillas, etc from getting hard in the microwave. 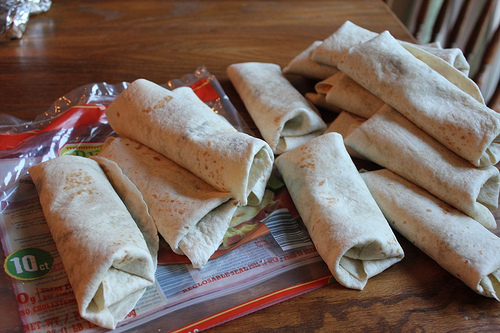 When I make burritos for the freezer, I wrap them in wax paper. I think it keeps them fresher in the freezer and makes it easy to defrost. We like to heat/ brown ours in a non-stick skillet. Does anyone have any experience freezing deli sliced meat? Seeing the post about freezing PB&J sandwiches yesterday made me wonder if I could make up a bunch of turkey and cheese sandwiches and freeze those? I’ve been doing a lot of freezer meals lately and I really go through the freezer ziploc bags quickly. Anyone know of where to find great deals on them? Currently, I buy a package of 152 gallon size freezer bags for $10.63 at Sam’s Club. That’s less than 7 cents a bag, which isn’t bad. Growing up my mom always did a bunch of pb&j and either ham & cheese or turkey & cheese for the freezer at the beginning of the month. this made getting ready for school in the mornings quicker and easier. By lunch time our sandwiches would be thawed and ready to eat. she used miracle whip/salad dressing. back then no one in my family liked mayo. however that is now all we will buy. Ziploc often has holiday freezer bags in December. I wait until they go on clearance after Christmas and buy them with coupons, though I didn’t figure a price per bag. I try to reuse bags as much as possible and have bought extra casserole dishes to freeze, as well. And I think $0.07 per gallon-size freezer bag is an excellent deal! My target price for those is $0.05-$0.08 per bag (http://ourfrugalhappylife.blogspot.com/2012/02/2012-buy-prices-cleaning-food-storage.html). I love all the freezer cooking, in fact we did the peanut butter sandwiches today. I have meatballs on the to-do list but I am running out of freezer space! Even with it being super organized it is packed to the brim. I think I will have to try one or two freezer sessions a week even though it does make for more convenient meals. I wish we had a larger freezer, but living in a small 2 bedroom apartment there is no room, although with 6 people in our family we could definately use it! I may have to think about buying a small one and tucking it into a closet or something! I made a triple batch of spaghetti sauce tonight for dinner. We ate it over rotini (made a double batch of the rotini) and then layered sauce, rotini, and cheese in a pan to freeze for later. I froze the last third of the sauce on its own for a quick dinner. I do this with just ground beef and cheese for freezer tacos. DH and I both love having these in the freezer. I pop ’em in the oven for a few minutes and go on about my day. I can pull ’em out for an EASY hot lunch. Thanks!! I really like making these burritos. My family really likes them for dinners or lunches. It is really nice having so many in the freezer to heat and eat. Another way I keep stocked up on burritos is anytime we have any leftover taco meat and beans I will fill up a few tortillas with the leftovers to make more freezer burritos. Thanks for getting me motivated to get some freezer cooking done. I have not done much lately. Does anyone know if you can freeze mayo? I really like burritos made with a tortilla, mayo, scrambled eggs, and sliced jalapenos, but I didn’t know if you can freeze mayo . . . I read once that mayo does not freeze well and you should use salad dressing instead of real mayo. Made the pizza pockets today because I had to make my refried beans today. I make the beans in the crock pot and they turned out great! So easy, I got the recipe from allrecipes.com. My daughter helped with the pizza pockets. Such a fun, yummy recipe! This was the very first site I’d ever heard of freezer cooking and I’ve been sold ever since. I cook for a month at a time and love having food at the ready. Yummm!! I think I need to make these!!! next time ground beef is on sale… I’ll add them to my ‘to do list’!! Great idea! I give a meal to my hairdresser at Christmas and she LOVES it. It is such a help. I’ve made the breakfast burritos several times in the past and we love them. My favorite way to reheat the breakfast burritos is to cook in the microwave for about a minute (to deforst) and then throw them unwrapped into the toaster oven for about 5 minutes. It gives the tortilla a nice little crunch while the inside finishes defrost and warming. My kitchen has never smelled so great or my freezer ever been so full. Thanks for challenging me to get in my kitchen and cook up some great AND EASY meals! We followed what you did this week – we made brown bag burritos (with our own little twist), ham and cheese pockets, and calzones! We also added in another freezer breakfast with our leftover ham and cheese…we made Get Me To Church Ontime Breakfast Casserole (basically scrambled eggs and the ham and cheese mixture baked in a casserole dish). Thanks again! The link above that says simply “maple” is a spam link…just thought I’d let you know 🙂 Oh, and I LOVE freezer cooking!! 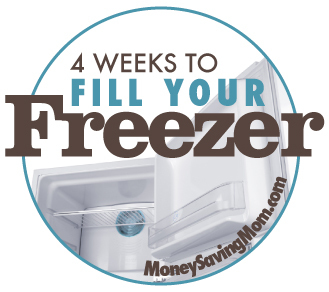 I’m not keeping up with my blog but I am cooking something for our freezer almost every day! Thanks for the challenge! Thanks so much! I just deleted it. I skip the paper towel and the foil when I make tortilla wrapped freezer meals. I either just put them directly into Ziplocks, or flash freeze them in a 9×13 pan then put them in the ziploks after they are frozen. This recipe has been SUCH a lifesaver for me ever since you first posted it. My high-metabolism hubby eats like a horse and sometimes it’s hard keeping enough leftovers in circulation to keep him full between meals. Now I just make a batch of burritos once a month or so and he can grab them to take to work to eat as a mid-morning or late afternoon snack, or it’s nice to know they’re there if we’re in a pinch for dinner and I need to whip up something quick. * I cut the ground beef back to 1.5 pounds and add a couple cups of brown rice instead. These are flavorful enough that I’m pretty sure I could completely leave out the ground beef and my husband would never notice! * I only use 2 cups of cheese. It saves money and they are still delicious! * I skip the paper towel step. The mixture is so thick I really wouldn’t call it “boiling” the cheese, so it’s not as weird as it sounds. 🙂 You can always just mix it in at the end of the simmering time, but it really saves time in assembling them! I was wondering is it red or white enchilada sauce and is it the bigger cans of sauce the 19 oz size or is it the smaller size thank you I want to try these because I keep all these items on hand and I think that that it would be so easy. I used red sauce. The cans are just the regular can size — I’m not sure on the exact ounces because I threw the cans out. Does anyone know for sure? I used approx. two cups of homemade enchilada sauce and they turned out great! Here’s the link to the sauce I make – I found it on pinterest! My husband loves it! I only got 17 but that’s ok. I substituted salsa for the enchilada sauce. I cut the chili powder by 2/3. Used 1 tsp. I added the cheese on top like you did. I think this is my favorite blog series! I have always wanted to utilize freezer cooking but have always been so overwhelmed! I’m so excited to get started… finally! Yay! I’m so glad you’re finding it helpful! I normally make all of my burritos, lay them out on a cookie sheet to freeze individually, then throw them in one big ziploc bag. When I need to eat one, I just take it out of the bag, wrap in a paper towel and microwave. It’s a lot easier than individually wrapping them in foil! Marcin, I needed help too! Life as Mom has a video demonstrating how she folds up her freezer burritos here http://lifeasmom.com/2010/07/freezer-cooking-lunches-and-frozen-burritos.html. Scroll to the bottom of the post. I think the trick to it is to not use too much filling from what I can tell. Crystal, are you sure you used burrito-sized tortillas? That package looks like the fajita size. My tortillas are from Costco, burrito-size, and they are huge! I’m not sure if I should double the filling when I make these brown bag burritos or just get smaller tortillas. I’m kind of a “rules” person and like to follow recipes closely. Thanks! I didn’t use burrito size tortillas this time (Aldi only had the smaller ones for some reason), but I usually do and this recipe works best with them as it’s harder to keep the filling in and roll them up if they are the smaller size. Just wondering how these would be with rice added? Anyone try that? Someone mentioned above that they added rice and loved it. I do have a comment that is probably going to take a lot of flames though…. As I was looking at your pictures of the burritos, I was shocked to see that you actually laid the tortillas down on top of the wrapper. I am a germ-a-phobe LOL. If you think about it, it’s hard to tell WHO or WHAT has touched that wrapper before it made it into your hands. Maybe it’s just me ?? I know I’ve caught my DH doing the same thing with sliced bread when he makes sandwiches and of course I always yell at him. Didn’t mean to offend just wanted to bring it to your attention. As you can probably tell, I’m not a germ-a-phobe. A clean freak in some respects, yes. A germ-a-phobe, no. The timing on this series is just perfect! With VBS coming up in a month and a new baby in 2 months, I’m getting excited to fill the freezer. Just yesterday I made your chicken tetrazinni to freeze. Oh, thank you for reminding me about Chicken Tetrazinni! I haven’t made that in awhile and need to put that on the menu again soon! Love this recipe! I think I will even add some homemade Spanish rice to it! Has anyone tried these with Flatbread instead of the tortillas? I’ve got two packages I got from Costco and the bread is wonderful but not sure how well it would freeze and reheat in this manner? Random sort of on topic question – has anyone tried to freeze quesadillas? I have some tiny tortillas I got from a CSA and filling them would either make them taquitos rather than burritos or just kind of sad. smells just like what you get in the packet! What size cans for enchilada sauce and refried beans? I’m not sure on the exact ounces, but they are just the regular can size. That was supposed to be “Thanks”, not “T”. These are great, but one batch of tortillas I purchased were really thin in the center and I couldn’t roll them without filling bursting out. I just made these tonight. I struggled filling them even with room temp tortillas. For some reason, the tortillas from Trader Joe’s seem to stick to one another and are a bit thin. I warmed them up slightly then filled them. They survived but it was not ideal. Anyone have any suggestions? I do not buy tortillas from regular stores so it has to be from TJs or Whole Foods… should I freeze them first, then split them apart and then when room temp fill them? 3 of us loved this recipe (I used less enchilada sauce, subbed rice for some of the ground beef and used 2 tsp. chili powder and 2 tsp. garlic), 1 didn’t like them because of the rice and the other didn’t care for them because of the beans… story of my life! Anyone ever tried these with chicken? Most of the tortillas from Trader Joe’s are made with rice flour, which makes them hard to roll. Did you happen to pick those up by mistake? My advice would be to look around at your local Latin food markets and get them authentic–they are the best. Make your own flour tortillas. Super easy since it’s flour, salt, baking powder, lard and water. Lots of recipes online and most are pretty similar so you can play with one and adjust ingredients as needed. I got all my stuff ready for the burritos and then I do not have any papertowels can I refrigerate the mix until I am ready to freeze them?? Yes, you definitely can. You could also use wax paper or freezer paper in place of the paper towels, if you happen to have any of those. I haven’t done extensive price analysis on these, but I love the foil wrappers at dollar tree. They are comparable to the footage on the cheap foil at dollar tree and much better quality. I use them for any and all frozen burritos! I put a link to a cookie recipe that I made today. It’s my families favorite. Makes 4 dozen. i keep a few out at room temp and the rest I freeze so kids and husband have a snack anytime they need one. I also freeze scones, biscotti and banana bread. Yummy! I finally made this and I am glad I did. I just had one and they are sooooo good! I am excited to mix up my husbands lunch with these. He will be pleasantly surprised. I made these for the first time this week and while i haven’t tried one myself, my husband (who wasn’t too sure about them!) took some for lunch today and actually CALLED ME to tell me how good they were! he never just calls, he usually texts so i can answer whenever if I’m busy, but he said he had to call to tell me, they were that good! Needless to say they’ll be a freezer cooking regular around here, and it gives me an excuse to try your slow cooker refried beans 🙂 i made a half batch, using grounds turkey and the original spice mix, plus cumin, because i didn’t have taco seasoning. can’t wait to try one myself! Your recipe calls for 2 cans of enchilada sauce. We live in an Eastern European country and they do not have cans of enchilada sauce. I will make my own, but how much is in one can? Or, how many ounces total do I need for this recipe? I made these and was so post to freeze them. Needless to say my family did not allow that. They were all gone by the end of the day. My boys loved them. How many calories in one burrito? Thank you! So this is like the 3rd or 4th time I’ve pulled this up to make. My husband loves these and they make a great quick lunch for him to eat at work!!! Thanks! Making these tonight for me and my husband for the week! What do you think of adding rice to these? Does it freeze well or no?